Just a few months ago, March to be specific, Korean telecoms company, Samsung, announced the release of the Samsung Galaxy S4. Fast forward three months and the company has yet again officially announced the latest addition to the continuously growing Galaxy product line. 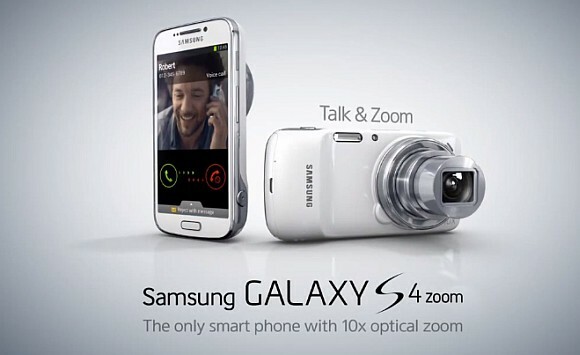 This latest addition to the Galaxy Smartphone range is called the Samsung Galaxy S4 Zoom. So what makes the Galaxy S4 Zoom different from its predecessors? Well, this latest Smartphone from the Korean telecoms company is the first of the product line to feature an optical zoom lens equipped with its back camera. But, is this the only thing that separates it from the other Smartphones in the same category? To find out, read this entire Galaxy S4 Zoom review here at Above Android. When you first lay your eyes on the Samsung Galaxy S4 Zoom, you will notice a number of similarities between this latest Smartphone model and its predecessor, the Galaxy S4. This is because a portion of the Galaxy S4 Zoom’s design has been taken from the S4, such as the rounded corners, the illuminated touch face buttons (at the phone’s front) and the aluminium edging. However, the back is a whole new different story. The rear of the Galaxy S4 Zoom is more than twice as thick as its predecessor. Why? Remember, this latest addition to the Galaxy family line has been incorporated with an optical zoom lens. This lens is the primary reason as to why the Smartphone’s rear is considerably thicker. The Galaxy S4 Zoom makes use of the same camera sensor as with the Galaxy S4 at its back, which features a 16.3 megapixel resolution. The optical image stabilization has been retained, but the lens capacity has been decreased, as the predecessor features a 21x zoom and this new one only has a 10x zoom. However, it is capable of recording videos at 1080p resolution and it also includes a Xenon flash, which is great for taking photos in low-light situations. To operate the zoom lens, you would need to control it using the dial. When not in use, the zoom will extend and contract. Despite the fact that the Samsung Galaxy S4 Zoom shares its name with the current flagship Smartphone, the Korean telecoms company decided to use the Camera line as the basis for the latest model’s specifications rather than for its predecessor. The Galaxy S4 Zoom features a 4.3 inch display screen that has a resolution of qHD 960 by 540, but this is a considerable drop when compared to the Galaxy S4. Fortunately, the S4 Zoom still utilizes the AMOLED screen panel technology. Additionally, the Galaxy S4 Zoom is powered by the dual-core 19 Exynos 4212. 1.5 GHz runs the Smartphone, which is paired with a ram of 1.5 GB. However, this is a step down from the Samsung Galaxy Camera which features a quad-core A9 Exynos 4412. Connectivity aspects are still the same though, with NFC, GLONASS support, Bluetooth 4.0, and 802.11m Wi-Fi. Both 3G and 4G LTE networks are also supported, although voice calls with the S4 Zoom are now officially supported. If you plan to use the phone for business purposes, you may also want to consider looking into the services being offered by other leading telecoms companies, such as RingCentral or Cisco or AT&T.